The multiplication table for counting calories to boost metabolism giving you more control over daily calories to lose weight the without overthinking what you eat. There are many ways to boost metabolism including putting on muscle mass and raising your basal body temperature. Untouched as a topic yet is how to effectively count calories to turn daily calories to lose weight a reality that you chose only by knowing. How to calculate how many calories you need a day based on your activity level? Many people just getting started out breaking into dieting put themselves under strict dietary watch, drastically reducing the their daily caloric intake trying to reduce body fat failing to get the nutritional balance that the body needs resulting in detrimental reduction of muscle mass. Sometimes what happens when you lose weight is that you lose muscle weight instead of losing fat. As happy as the thought of losing weight may sound at the time, you just received a big hit where it hurts, in your basal metabolic rate that causes your muscles to burn off as energy. Can you really call this succeeding in dieting...? 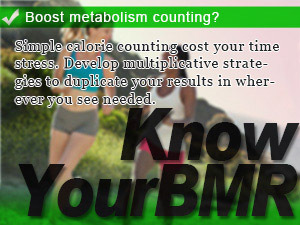 In this take on Slism we will present a tool to help you understand how to boost metabolism making counting calories simple as multiplying adjusting daily calories to lose weight. One thing that comes to mind when thinking about dieting it to cut, cut, cut back on calories until there is no room for energy lying around to be converted into fat. That is to say the few calories the better. Although attractive this sort of thinking doesn't get you anywhere like a car empty on gas trying to go grocery shopping. Before thinking about cutting back you need to know the minimum calories need to maintain life that is how much calories you need to get by functioning to tip top shape. After all, nobody likes to study or go to work thinking about food all day, or in the worst situation not have the thinking capacity to do just that. The amount of energy required working, breathing, have a beating heart, and to all extend to live can be roughly estimated using your basal metabolic rate. These task or done unconsciously by your body and if energy becomes low, there is a risk to that they shut down unknowingly. For many reasons including the addressed above raising your basal metabolic rate versus decreasing calorie consumption is a far more effective way to boost metabolism. In this way, Too reduce calorie consumption, it may reduce the body weight, so that you've made the constitutionally predisposed to gain weight, increasing the chances that your diet rebound. While dieting is important to develop a fat centric sense of where the weight you lose is going versus only looking at the number of pounds you lose. The standstill in dieting to lose weight is to balance the equation involving calorie consumption and calorie intake to avoid potentially dangerous situations such as running out of energy or obtusely storing energy away as fat that every diet must know by now. This is where in case of losing muscle mass your metabolism slows down leaving less wiggle room in the calorie intake deportment and no choice but to force restrictive caloric dietary requirements on yourself to make up for the difference, or try to put on more muscle. 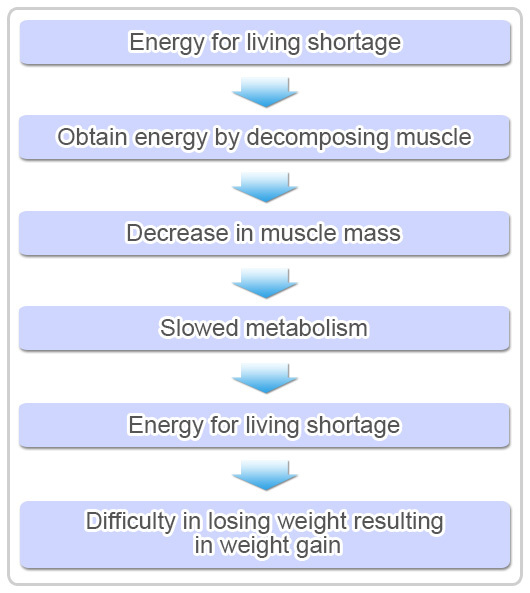 In addition, you must take in energy more than the basal metabolic rate. That is to say the amount of calories you take in eating should be close to your basal metabolic calories, the adjusted amount of calories based on your basal metabolic rate. If the amount of energy you burn of during daily activity is low there runs a chance of gaining weight. Energy consumption needs ultimately depends on your level of activity. Of course, for people who do not move body at all and the people who are moving the body well, energy consumption is of course different. Here is a summary of the recommended calorie intake per day based as level of physical activity by the Ministry of Health, Labor and Welfare of Japan to serve as a good point of reference regardless of where you live and help you figure out how much calories you need each day. Low Spend most of your time in a sitting position mainly static activity. This could include working a desk job not requiring physical labor or staying at home playing video games all day or avid nonstop book reading binges. Medium Siting position mainly, office work, reception with occasional commuting, shopping, or housekeeping. This also includes activity such as standing in place like you would have to do working at a home electronics store. High Work involving manual labor, moving and standing resulting in habitual leisure such as sport or other strenuous activity. This could involve being part of a recreational sports team requiring frequent meeting for practice. Calorie control is to ensure that not less than the basal metabolic rate is, of course, you need to do according to the amount of their activities. 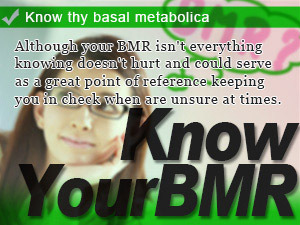 Do you know your basal metabolic rate? Basal metabolic rate and body temperature, and so have different muscle mass, by various differences, is difficult to compute a numerical value with the exact amount of basal metabolism rate. In addition, the formula for calculating the basal metabolism has been published so many differences may appear to a number which is calculated by the difference in the calculation. The diet Slism, using the formula of Harris-Benedict, which is also used generally, but not those made for Japanese originally this formula Westerners are of interest. Therefore, the basal metabolic rate was derived by Harris-Benedict equation, may be a little higher in the Japanese calculated. Does your pedometer keep telling you that you need to walk more? Maybe it’s wrong. Now you can get what a smart pedometer. This time around calories and your diet will match. Simple calorie counting cost your time stress. Develop multiplicative strategies to duplicate your results in wherever you see needed. 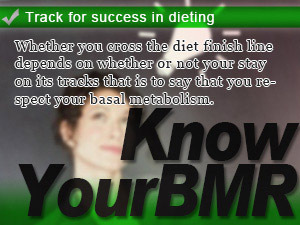 Whether you cross the diet finish line depends on whether or not your stay on its tracks that is to say that you respect your basal metabolism. Although your BMR isn't everything knowing doesn't hurt and could serve as a great point of reference keeping you in check when are unsure at times.